Eurolog 2019 – Save the date! It is our great pleasure to invite you to the 25th EUROLOG Congress on 3-4 April 2019 in Athens, Greece. It has been eighteen years, since Athens hosted the 7th EUROLOG Congress on 2000, during an emblematic period for Greece and the city of Athens. The preparations for the 2004 Olympic Games were at their peak. A legendary challenge – which was finally perfectly fulfilled – was to provide a new perspective of the Olympic ideal, through the harmonious combination of cutting-edge technologies alongside human culture and arts and always with a scent of old values and invocation of our ancient roots. The 25th EUROLOG 2019, is being organized at the beginning of the 4th Industrial Revolution, which has led to profound changes not only to the field of industry, but also to the society in general, as well as to the economic rhythm and outlook. Logistics are more important than ever, for every small or big company or organization and like – almost – no other sector of the modern economy, contribute significantly to the creation of relationships between individuals and organizations and the connection between different nations worldwide. 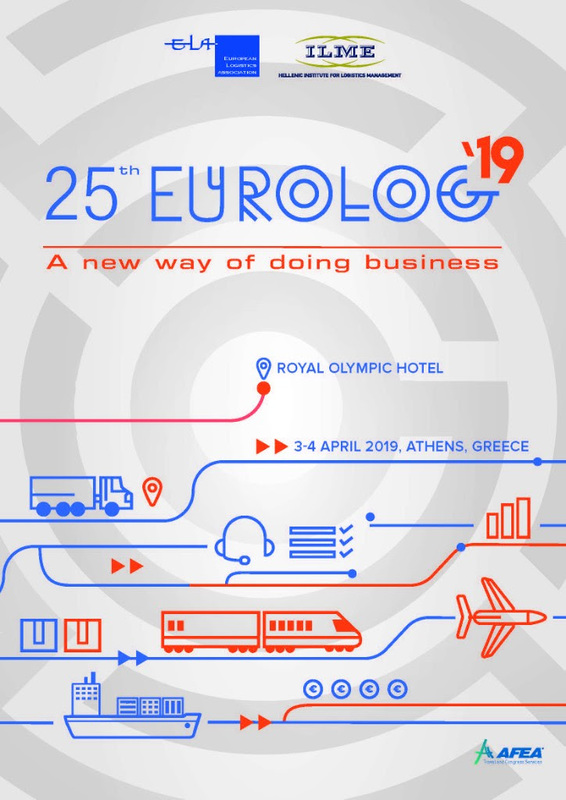 In this context, we would like to encourage you to join the 25th EUROLOG in Athens and learn more about “the new way of doing business” and the factors that underpin the success of logistics in the era of digital economy, through Keynote speakers, lectures and presentations of awarded innovative logistics and global supply chain projects. Join ELA Talents day Workshops related to how to attract women in supply chain and Leadership in Supply Chain. We look forward to welcoming you to Athens and to the 25th EUROLOG Congress! Το ILME, Ελληνικό Κέντρο Ευρωπαϊκής Πιστοποίησης Logistics, διοργανώνει για το 2019 δυο νέους κύκλους εξετάσεων για την Επαγγελματική Πιστοποίηση ELA, στα επίπεδα EJLog και ESLog, οι οποίες θα διεξαχθούν στην Αθήνα και στην Θεσσαλονίκη. Ο πρώτος κύκλος εξετάσεων θα υλοποιηθεί στις 26 / 27 Ιανουαρίου 2019 για τις γραπτές εξετάσεις και στις 9 / 10 Φεβρουαρίου 2019 για την συνέντευξη, ενώ ο δεύτερος κύκλος εξετάσεων θα υλοποιηθεί στις 22 / 23 Ιουνίου 2019 για τις γραπτές εξετάσεις και 6 / 7 Ιουλίου 2019 για την συνέντευξη. Οι ενδιαφερόμενοι μπορούν να συμβουλευθούν την ιστοσελίδα του ILME σχετικά με την Ευρωπαϊκή Πιστοποίηση ELA, και τους φορείς εκπαίδευσης που εκπονούν εκπαιδευτικά προγράμματα βασισμένα στα Ευρωπαϊκά Πρότυπα. Για οποιαδήποτε άλλη πληροφορία μπορούν να απευθυνθούν στο ilme-ecl@ilme.gr και στο τηλ. 210 6747361 [κα Βασιλική Λαιζηνού].